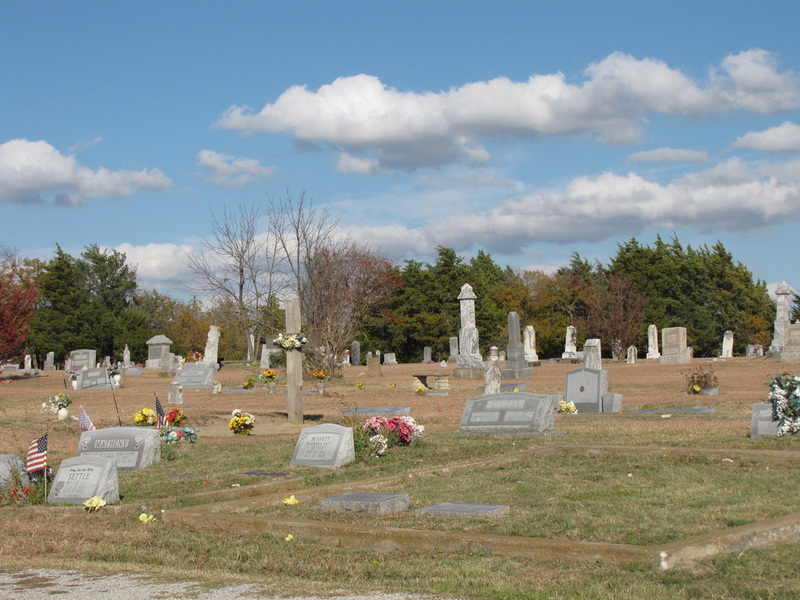 This cemetery was associated with the communities of Westminster and Sedalia, which was a few miles northwest of Westminster, and with the Elm Grove Cumberland Presbyterian Church. The church was established in 1874 and disbanded in the mid 1930's. The deed for the church is listed in Vol 18, p 522. The church building was southeast of the cemetery and faced west. In 1933 the district church gave the land to the Elm Grove Cemetery Association with the deed listed in Vol 291, p 194. Elm Grove Creek runs by the cemetery. The cemetery is still in use. The cemetery is not fenced and covers several acres of land. There is a sign that says "Elm Grove Cemetery." The cemetery has a historical marker. There was some argument about who gave the land for the cemetery. The marker says that the Roland family donated for the cemetery. One family insisted that the Fields family had given the land based on family history and demanded that the historic marker be taken down. They wrote a very good history of the cemetery and community but did not prove that their family had given the land for the cemetery. There is only one Roland buried here. His wife might be buried next to him but there is no stone to verify that. Most of the Rolands are buried in the Coats/ Horton/Roland Cemetery, which is about ½ mile due south near the old home place. EARLY 1900S, AND A LATER BAPTIST ACADEMY. Ezekial Roland is the only Roland buried in this cemetery, with the possible exception of his wife, who may or may not be buried beside him. When he died in 1859, he was in his 30s. He died intestate, which seems to indicate that he did not donate the land for the cemetery. The Elm Grove Presbyterian Church was started years after his death, which is further indication that he may not have donated the land. 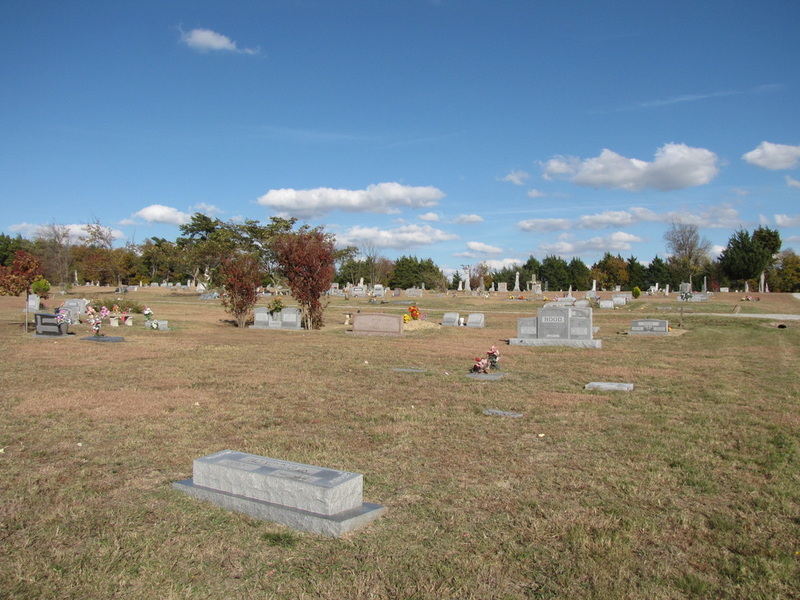 The Fields family, which owned land east of the cemetery, claims that their family donated the land for the cemetery, which has several members buried here. No deed has been found for either family donating the land for the cemetery. There is a Roland family cemetery, started by Sherrod Roland, about ½ mile south of the Elm Grove Cemetery. ...[Ezekial Roland] goes back to Cotaco County, Alabama, which was later known as Organ county, His father Christopher Roland (son of Robert Roland) and his mother, Martha W. (Patsey) Pace (daughter of John Pace), applied for and receive their Marriage Bond in Cotaco County in 1818. Christopher and Martha Roland has three sons named John, Sherrod (referred to as Sherrod II in order to distinguish him from his uncle Sherrod I who was Christopher’s brother) and Ezekial. In the year 1828, Christopher sold his land in Morgan County to a brother, Joseph, to travel with another brother, Sherrod I and wife, Elizabeth (Betsey) Pace Roland to Fort Towson (Indian Territory...). Martha and Elizabeth were sisters who married brothers. Christopher probably died on the way to Fort Towson or soon after they arrived in the area because the next evidence that has been located is that of Martha and her sons in the 1830 U. S. Census in Monroe County, Arkansas. The census lists her with her second husband, Ebenezar Ingram, and three Roland sons and two young Ingram sons. In 1831, Martha’s and Elizabeth’s father, John Pace, died intestate, in Blount County, Alabama. In the Probate minutes, all the children were named. From this we know that Martha had married Ebenezar Ingram. Later in 1838, Martha appears in the Red River County, Texas, courthouse to record the sale of her Ingram land. (This land is geographically located a few miles south of Fort Towson.) The land had originally been granted to Ebenezar. Eight days later, Martha appears at Red River County married to Noel Arrington. It is apparent that this marriage took place between March 1 and March 9, 1838. John Roland, the oldest son of Martha and Christopher, was killed in the Texas Revolution against Mexico in August 1836. ... A Land Grand of 1,920 acres was deeded to his heirs, Martha, Sherrod II, and Ezekial (his mother and two brothers). Sherrod II signed a statement that his mother and brothers were residents of Texas by November 1834. In 1853, Martha, Sherrod II and Ezekial appeared at the Collin County Courthouse to record the division of the land between the three of them. Martha was again a widow by this time as evidenced by the 1850 census. Ezekial Roland married Mahala Pace, his cousin, and they had four children named George Robert, Elizabeth B., John H., and Ezekial Francis. Ezekial Roland was the first of John Roland’s heirs who died.... There is a space for his wife Mahala which is empty according to cemetery records. Martha Arrington died in 1882 and is buried in Elm Grove Cemetery next to W. A. Pace (Uncle Billy). The person buried next to Uncle Billy was believed to be his wife, but it was later discovered that he never married. While researching the cemetery records, it was decided that evidently Martha (Patsey) was buried next to her nephew. Nearby are the graves of James Ingram and daughter, Melissa. James Ingram was Ezekial’s half-brother. Sherrod’s and Susan’s daughter, Martha Elizabeth Russell, is also buried nearby. The John Roland Survey, on which the cemetery is located, was the beginning of the town of Westminster. It was a flourishing town for many years. Susan Roland donated the land for the Seven Points college in Collin County. At first it was named Seven Points College and was a part of the Texas Methodist Conference. From Plat Book, Map of Westminster, page 382,... there is a deed for 108 acres of land on the John Roland Survey for the town and the college. W. L. Fagg was the President of the Conference. In 1897, this was a four year theological seminary. There were twelve students who received a Bachelor of Divinity degree upon graduation. After 1902, the college was purchased by the Baptist Church. It became the Baptist Academy, a preparatory school for preachers and teachers. Susan Roland had two grandsons who were Baptist ministers, James M. Simmons and Joseph Kelly Simmons. Joseph was the editor of The California Southern Baptist publication. He died in 1963.